"Ancon" will help you to rent apartments and houses as well as business class apartment in Cuba (Havana). Renting apartments by using our agency is economically attractive for the customer. "Ancon" provides promptly. Our database contains a wide variety of accommodation options in Havana from budget to luxury class. Rental private residences apartments offered on our homepage are carefully selected according to the analysis of housing conditions to ensure maximum comfort for our guests during their stay on the island. Our proposals are of the highest quality! When renting an apartment it is required to specify its code. Example: vil5. Select 3 or 4 variants and list them in order of preference. Apartment built in the 50s. 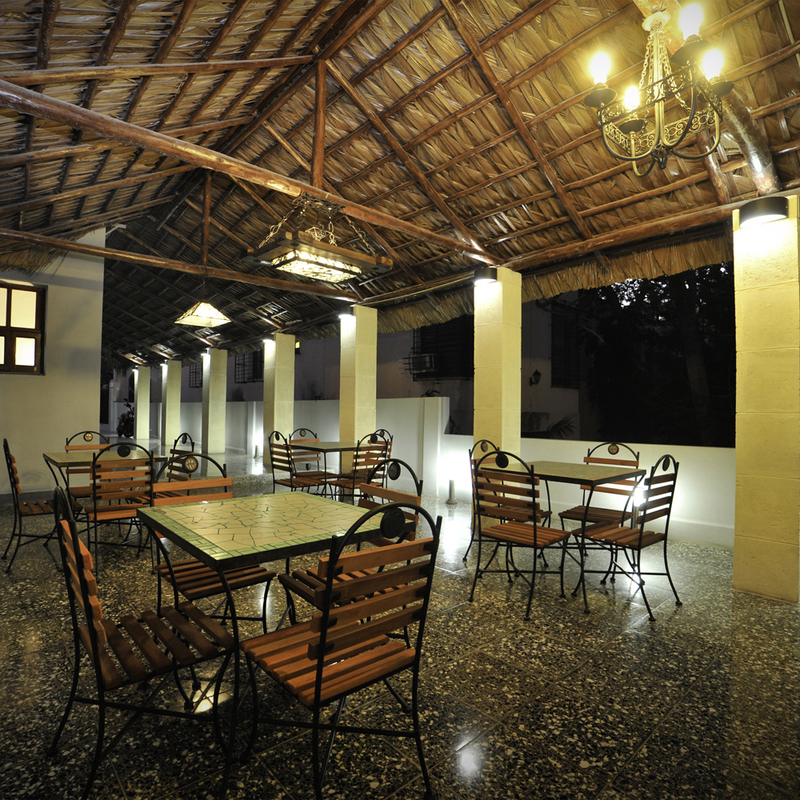 Big terrace, spacious and well lit rooms, antique furniture. Each room has its own bathroom. Garage. Apartment built in the 50s. Large terrace, spacious and well lit rooms, antique furniture. This villa was built in the 50s. It is located in an exclusive area of Miramar. There are 5 spacious and comfortable bedrooms, 3 bathrooms, a spacious terrace, a rancho, a big garden, safe and parking space. Apartment built in the 1940s. Spacious rooms, recently renovated, antique furniture. Two bedrooms have private bathrooms and the third bathroom is to be shared between the other two bedrooms. Ornamented ceiling. Original design. Apartment located in a building that dates back to the 50s. Spacious and well lit rooms, modern furniture. Near the sea. Pent-house built in the 50s. Large terraces, spacious and well lit rooms. Modern furniture. Recently renovated. Each room has a private bathroom. Sea view. Apartment by the sea located in a building that dates back to the 50s. Balcony and ocean view. Spacious and well lit room, modern furniture. Safe. Private Independent Apartment built during the "American period", fully renovated, modern furniture, balcony and view of the sea and the fortress El Morro. Private independent apartment with modern and minimalistic design. Good quality furniture and interior decoration, terrace. Luxury apartment located in one of the tallest building of the city that dates back to the 50's of the 20th century. Panoramic sea and urban view. Upper level apartment with large balcony. Recently renovated. Modern furniture. Luxury apartment located in one of the tallest building of the city that dates back to the 50's of the 20th century. Fully renovated, original interior design, modern furniture and balcony. Sea view. Also view to "Los Presidentes" Avenue. Luxury apartment located in the most famous building of the city: the Focsa building. 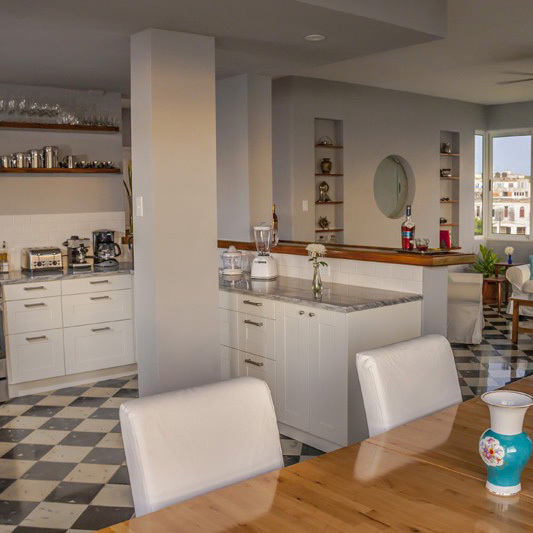 Recently renovated, modern furniture, kitchen, sea view, and a view to the National and Havana Libre hotels. Colonial style house in which the original design was preserved. Antique furniture. Excellent location, parking space, patio, domestic staff, only 100 m away from the Havana sea wall, easy to get to Old Havana. Colonial style house in which the original design was preserved, as well as the antique furniture. Excellent location, near to the Havana sea-wall. Spacious rooms. Penthouse built in the 50's with panoramic ocean and urban view, modern furniture and interior design, terrace. Located in an excellent area, facing the Malecon (sea wall) and the National Hotel. This mini-hotel is located in a house built in Art Deco style and keep their original design, beautifully renovated, stylish furniture, view of Old Havana from the balcony and terrace. Private Independent Apartment built in colonial style. It keeps its original design, beautifully renovated, antique furniture, balcony with street view, close to the Old Square. All the attractions of Old Havana are located very close. The apartments are in a house with "Art Deco" style, preserving the original designs and 1940's improving styles. 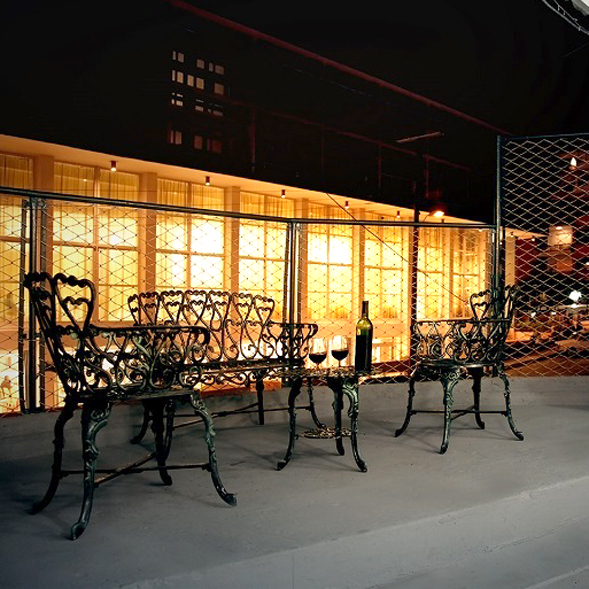 Well remodelated, stylish furniture, balcony with a view of "Habana Vieja" (Old Havana), terrace. Top quality apartment built in the 50s. It has 4 bedrooms, 5 bathrooms, large terrace, spacious and well lit rooms, recently renovated, modern precious woods furniture. Safe. Parking space. 24-hour domestic staff. Colonial style house. It has 3 bedrooms, 2 bathrooms. Spacious bedrooms, recently renovated, modern furniture, large portal, backyard and parking space. Residential area. Restaurants and night clubs are located nearby. Top quality apartment, built in the 50s. 2 bedrooms, 3 bathrooms, Jacuzzi, billiard table, spacious and well lit rooms, recently renovated, high quality furniture. Safe. Parking space. Independent apartment with modern interior design and furniture. The apartment has air conditioning, hot water, fridge and phone. Each room has its own bathroom. Classic style house built in the 40s. Residential area. Spacious rooms, good quality renovation, stylish furniture. Smoking area. Ranchon. Large backyard. Parking space for several cars. The mini-hotel is located in a "Classic House", preserving the original designs and classical styles. Remodelated. Wide balcony with a view of "Plaza Vieja" (Old Plaza). Business class rooms. The apartment is located in one of the highest buildings of the Cuban capital, and was built in 50's. Excellent location. Modern layout, spacious and well-lit rooms, modern furniture, Havana sea wall view. Independent Studio, in a 1950´s building, with a panoramic view of the city and the sea. The apartment has all the necessary facilities, air conditioning, 1 bathroom, hot water, a kitchen and safe. The house dates back to the 50s, it is located by the sea in a very good neighborhood, modern design, with 4 bedrooms, 3 bathrooms, portal, backyard, domestic staff, and parking space. 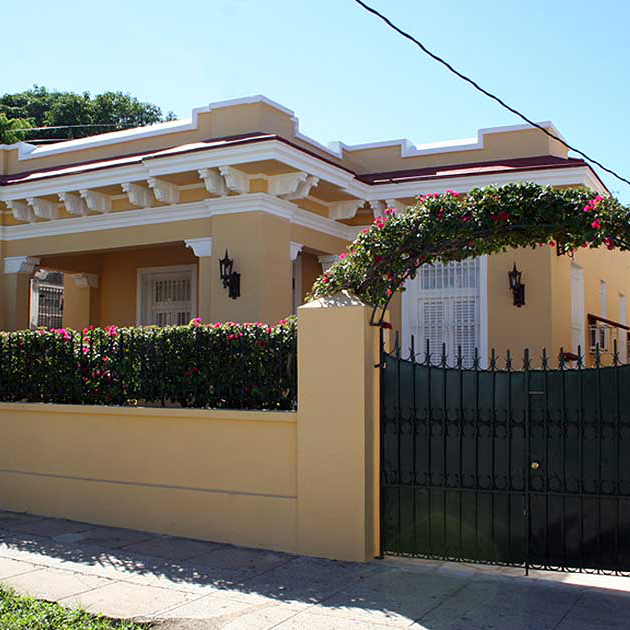 This comfortable independent apartment is located in the most prestigious area of Old Havana. This top-quality independent apartment has ocean and urban view. The design is modern and sober. 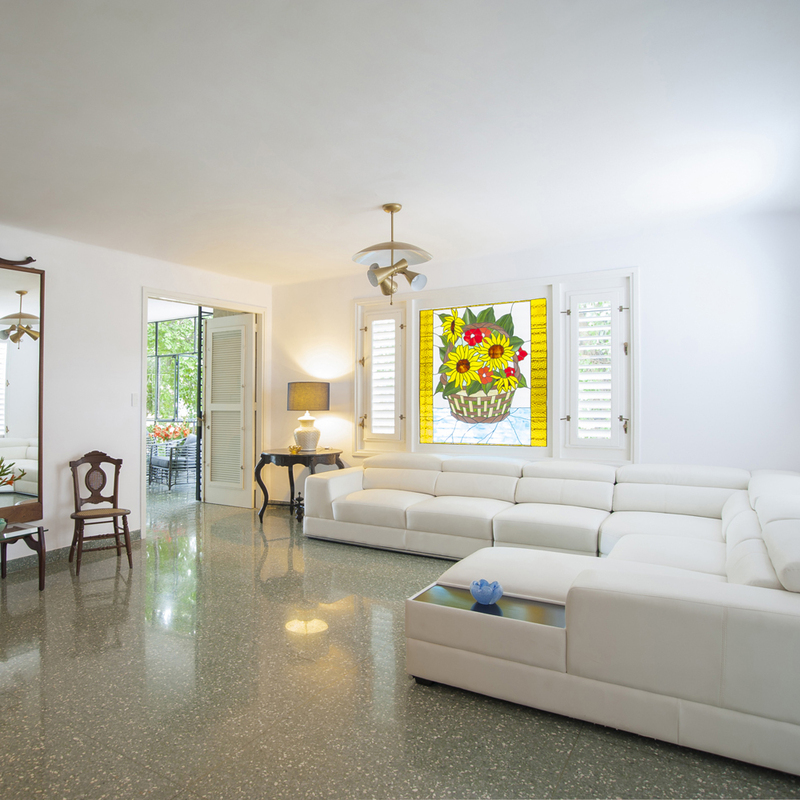 The apartment is located in Vedado, one of the most central areas in Havana.